At first, it was only a gentle tapping of sleet against the window, but it was enough to waken me, suggesting that something more than a cold rain might be in store. The forecasters had seemed confident of snow, so I got up and began watching. Before long, flakes appeared: not many, and not so dramatic as those recorded earlier in the evening by people all along the coastal plain, but flakes nonetheless. Despite the hour — 4 a.m. — there was only one thing to do. I put on a pot of coffee, and got dressed. By six o’clock, an inch had fallen. Temperatures along the water always are a few degrees warmer than those farther inland, so our snow was a bit slushy; it didn’t accumulate on the grass, and began melting almost immediately on plants. Still, on rooftops, table tops, and the cold fiberglass of boats, it stayed until well after dawn. 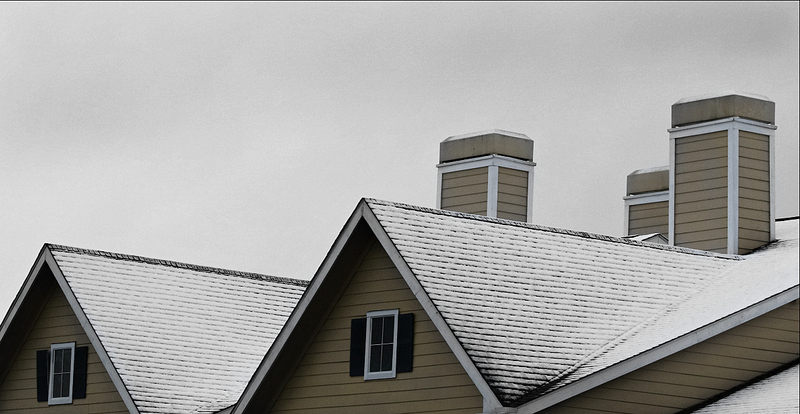 Even run-of-the-mill rooftops took on new interest with the addition of snow. On the day you see below here. For an account of the famous — and far more substantial — 2004 Christmas Eve snow known locally as “The Christmas Miracle,” please click here. I also awoke to a dusting of snow this morning and am feeling quite depressed about it. :( Hopefully ours will melt soon too. It is a comfort knowing that even way down there snow came to visit. It does make a difference whether a dusting of snow is a one-time occurrence or the beginning of a long, cold slog. Here, everyone’s spirits were lifted: the anticipation went on for days, and the excitement was palpable. The number of people who were out and about at 5 a.m. was remarkable. Usually, it’s only the dog walkers who make it out at that hour. I do enjoy snow. I wouldn’t want to live in it again, but every occurrence brings back pleasant memories. I hope yours melts as quickly as ours did. I hope it does, too. For some reason this winter is harder on my spirits than usual….I remember being young and feeling anticipation and delight with snow but as you say, now it just seems like the beginning of a long cold slog. Well, maybe you should turn yourself into what we call a snowbird, and fly down to Texas for a winter break. In the late fall, certain roads fill up with cars, trucks pulling small trailers, and even RVs. Their license plates tell the story: South Dakota, North Carolina, Illinois, Idaho, Michigan. They come down to one of the many campgrounds or RV resorts that dot South Texas, and then, when the birds begin heading north, so do they. In lieu of that, of course, you always could come down and visit. That’s interesting. I’ve heard the word “glamping,” but I’ve always associated it with the big RVs towing Mercedes or BMWs. I suppose the combination of “glamour” and “camping” led to that. You’re certainly right about the importance of “warm.” When I was living aboard, a lot of inconveniences were tolerable as long as I was warm. 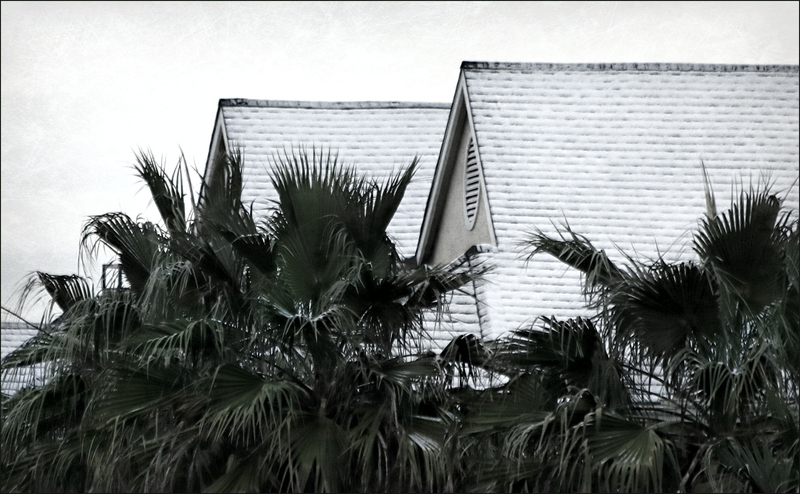 I’ve never been to Texas, and the sight of snow on a palm tree seems very odd to me. Because the Great Lakes aren’t freezing over much, and the winds scoop up more moisture, the areas east & west of my home, will be getting more “lake effect” snow. Fulton (near Syracuse) uses runs 110 inches. I love the second shot, because they look like a sky full of little glowing balloons! Snow on a palm tree seems odd to us, too. That’s why everyone runs out to gawk when it happens. I was sorry the snow didn’t coat the plants this time the way it did in 2004, but we take what we can get. I did find a banana leaf that had a substantial pile of slush on it, but the photos looked pretty much like a formless pile of melting slush. I did see a photo from a hundred miles down the coast of a banana tree bearing both bananas and inches of snow — maybe next time I’ll be gifted with something like that. I’ve never before taken a photo of snow falling, and didn’t know quite how to do it, or what to expect. I ended up liking both photos very much. 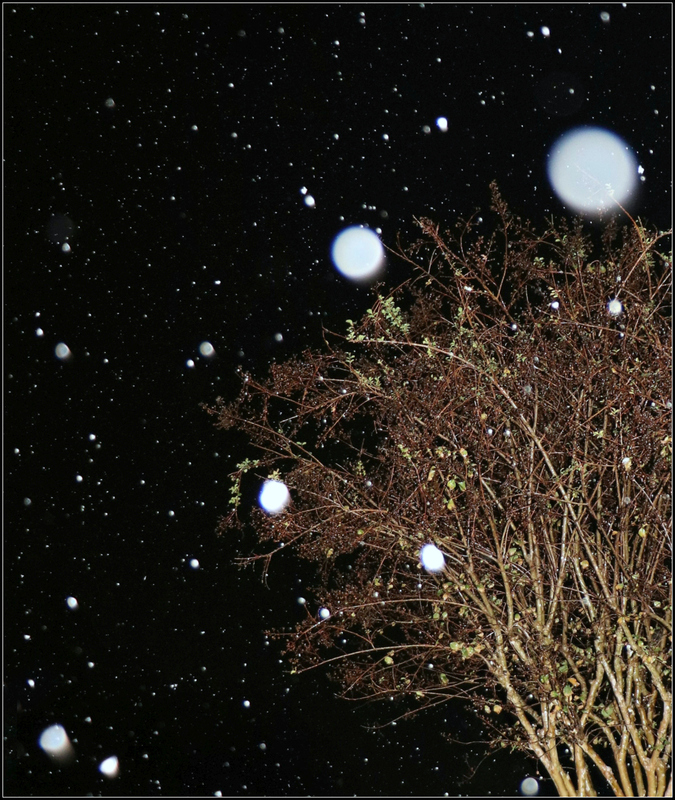 At different times, I saw the flakes as planets and galaxies, tree ornaments, and (like you) balloons. Next time, I’ll know better how to approach the photo-taking. With luck, there will be more snow. When the banana trees outside my window bear again, I’ll snap a photo for you. They’ll freeze back from time to time, but they always recover — at least, in time. I knew you’d be posting images of the snow – thanks- and thanks for the narrative of hearing the sleet on the windows.. brrrrrr, you managed to roll me back in time and remember what it’s like when the cold runs to the coast! I also enjoyed Robert’s comments about snow on palms and bananas in Texas! I suspect that freezing temps would rapidly destroy all those years of growth…. I suspect you know what happens to frozen banana plants; they turn brown and mushy and soft, and pretty much disintegrate. But a friend in the hill country has bananas that were gifted to her around 20 or 25 years ago, and every year, after they freeze back, up they pop. It’s amazing, actually. I don’t cook with green bananas now. In Liberia, we often had cooked plantain, as well as cassava. Now, if I’m going to have a starch, I prefer rice or wild rice. On the other hand, plantain chips — fried in palm oil — are pretty darned great. We used to use them as a substitute for tortilla chips with our guacamole. ah yes, of course you learned the art of cooking with green plantains.Hhere in ecuador they use them so many ways, amazing. tonight friends served a cassava ‘tortilla’ that was very nice. it’s very late – am just home after a very long visit with my cute neighbor, who lives in new york but is back on a long vacation to her home country. Time for sleep! oh, and yes, i suspect that tortured banana plant would look quite horrid after a freeze! It was a nice little gift, this blanket (okay, more like a light sheet) of snow. I think my spot received about an inch, but I don’ t know what the ‘official’ Austin total was. You reference the 2004 snow event and I remember that well: my children were so excited to have a significant chance of snow that day–we waited and waited and Austin just missed the sleigh on that one; cold day, nada snow. Late that night, I checked news and in Corpus (where I’m from) they’d received 5 or 6 inches!! Bummed doesn’t even come close to how we felt! :) Anyway, I’m glad we don’t have snow for months on end, but yesterday was nice. 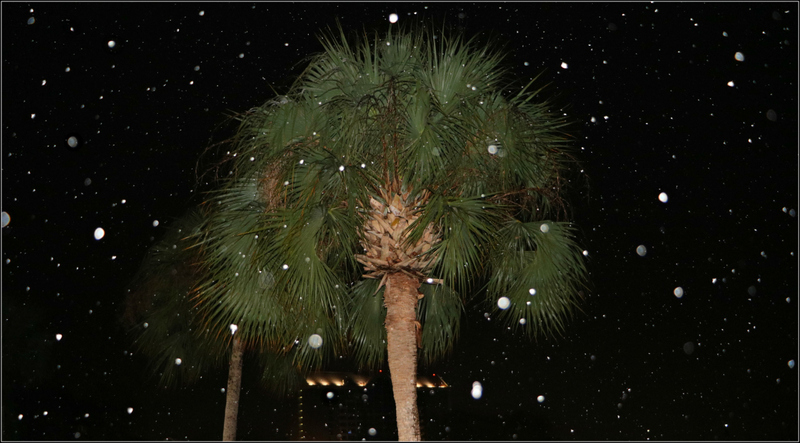 Great shots, love the palm tree with snowflakes falling. I know how you felt when you missed it. The photos I’ve seen from Brazoria County, and the refuge, have been just splendid. I’m not sure they received so much more snow — two inches is the highest total I’ve seen — but it was colder, so it stuck, and stuck around. Maybe next time I’ll turn myself into a snow chaser, rather than a storm chaser. Of course, snow is one of the most unpredictable weather events. The forecasters here were vacillating until the flakes began to fall. Like you, I don’t want to live in snow again, but I certainly do enjoy it when it comes to visit. I was waiting to see what you thought of the snow down there. Oddly, the valleys here are snow-less but the ski areas up higher are open. One thing is certain. Whether the end result is an inch of snow or a foot, the excitement of seeing those first flakes is the same. I wish we’d had more, but I’m happy that we had any. Today, it’s clear and very cold. The unshaded puddles that are left have just a slight skim of ice on them, but in another hour or two it will all be gone. Last Monday, it was in the 80s. The forecast high for this coming Monday is 70. So we sandwiched some snow in between — it’s Texas weather at its finest! Not only that, I combined the “gentle tapping” with the phrase “might be in store” — an implicit rhyme I thought might evoke a certain bit of Poe-try in someone as sensitive to words as you are. As for the gentle tapping itself, I was happy for it. Rain never wakes me, and snow surely wouldn’t have. Had it not been for the sleet, I probably would have missed everything but the tail end of the event. Isn’t this weather a hoot!! Love that poem, it fits in perfectly. We have finally gotten the rain and a dip in temperature, but don’t think I’ll see flurries here like I did back in 1977. It would be terrific though if I were proved wrong! It truly is. Sandwiching snow in between lovely days of summer-like weather is just so — odd. But, that’s Texas weather. The pendulum always is swinging; it just doesn’t usually swing this far, this fast. It looks as though everything’s fairly placid in your area now. When I saw the notice that our radar’s going down for a week of maintenance, I wondered about that. Then, I saw our forecast — a week’s worth of sunshine and mild temperatures. I’m ready. Oh, my. The unpredictability of weather can lead to some real disappointments. It’s hard for me to imagine Norway without snow, but your visit no doubt wasn’t dependent on the weather for its pleasures. Still, it would have been nice. Here, every trace of our snow was gone by mid-morning, and now we’re back to telling each other stories about our latest snowfall. It certainly was proof that we just never know what surprising delight is going to come our way — and who knows? Winter is just beginning! It took me some time to figure out that first image……was it some strange bird….! But no, eventually I got it. In the mid 90’s I was living in Adelaide beach side but had prior lived in Adelaide Hills which are close by but much different climate. Snow (a rarity) was forecast and early next morning I was out and up there to experience my first ever snow. It wasn’t deep but it was enough to coat things. Out in the rural roads what struck me the most was the silence that accompanied the snow. Magical. However, I can’t imagine ever living where deep snow is a commonplace event. Brrrrr! Maybe later this week I’ll change my mind-temps in 40’sC predicted. Now that you mention it, I could have contextualized the photos better. I certainly like your vision of them as great, strange birds! One reason the perspective is a little strange is that I live roughly on the level of the palm tree fronds. In fact, I was shooting down, just a bit. So the usual way of seeing palms, with their fronds above us, was distorted. You’re exactly right about the silence that the snow brings with it. I’ve always noticed it, and finally I looked up the phenomenon. There may be more complete articles, but this one gives the basics. I’ve spent some evenings walking in deep snow that have been almost eerily silent — so silent that I began straining to hear anything. But what a wonderful experience it is! I remember what 40C feels like, and it would be a hard choice to decide: snow, or oven? I think I’d still take the heat, but “temperate” would be better still. Sorry your snow didn’t coat the ground Linda, By the time I went out at 4:15 am the ground around my place had a couple of inches easy. I know it was the fact I haven’t mowed in over a month that allowed so much to accumulate, floating a few inches off the warm ground. It kept coming down for another couple of hours and by the time it stopped a winter wonderland was left for the thaw. That makes sense, because the snow was traveling from west to east. You got it well before I did. When I got up, I found online reports from Wharton, Katy, and so on, and I think I saw the snow before the NWS down in Dickinson did. Your photos are great — I’m so glad you got more than a dusting. It was much colder here this morning. There wasn’t any ice in the birds’ water bowls, but there were light coatings in puddles here and there. Now, we’re on our way back to highs of 70 or so on Monday, which suits me just fine. If it’s not going to snow, I’ll take sunshine and warmth! I saw some photos of Connecticut about an hour ago, and there were several reports of more than five inches across the state. A friend has a daughter who lives there, and she was mightily excited over it all. I hope your son enjoys it — I suspect he will. I was hoping for more snow, just so I could get one of those wonderful photos of it swirling around under the lights, but that wasn’t happening. No matter. Maybe by the time the next snowfall arrives, I’ll have figured out how to use my camera for a video. Always exciting to see the first snow. I haven’t seen it since Christmas 1978/79 in London when the snow actually stayed on the ground and we built snowmen. Treacherous driving though as the council were on strike and no salt was laid on the ground. I often wonder if London has seen snow since then as usually the city is too warm for deep drifts (like in the English countryside). We almost crossed paths. I was in London around Christmastime twice in the mid-to-late 70s. It didn’t snow when I was there, but I’ve never been so cold in my life. I think it was the combination of the dampness and the temperature — and a lack of central heat in the place where I was staying. Feeding coins into a wall heater was a new one. It has snowed since. I found this photo essay about a significant London snow in 2009. There are some really great photos, including one of a proper English gentleman with a bowler and umbrella making this way through a street. Feb (?) 2009 was when we had the hottest day since records began, in Melbourne. It reached 46.3 C and every single leave on every bush was burnt to a crispy brown and many lost their lives in the bushfires here. Seems like 2009 was a year for temperature extremes all around the world. The sky was a dirty red in Melbourne city from all the bushfire smoke in surrounding outer suburbs and country regions. I heard that you’re having some high temperatures there now, at least in part of the country. Heat is one thing, but I hope you’re spared fires. They’re a terrible thing — as California is relearning just now. With us, it started – with just a very few and tiny flakes of snow – in the afternoon of Friday, Dec. 8. That was off and on still, though. And then, when it was dark, it snowed more, and we got some white on the grounds. [You know what it looked like from my blog.] We were happy about the looks, but we didn’t stay up to watch. All the more happy we were when we still saw snow – some, in spots – in our garden the next morning. That looked beautiful. What do you think? Will we get more? Or was that, as so often happens here in southern Texas, the only occurrence of snow in a winter? We’d really appreciate more. I enjoy watching it snow as much as I enjoy the snow on the ground. When I lived in Iowa and blizzards were quite common, it was wonderful to watch the snow blowing around the street and yard lights. When it was done, shoveling a path clear wasn’t so much fun, but it wasn’t awful. Of course in those days no one had a snow blower, so it all was done with shovels — and pauses for hot chocolate every now and then. Will we get more? Of course I can’t say, but I will tell you this. On the Tuesday before the snow came, I found myself humming the song “Let It Snow” on my way to work. Three days later, it snowed. I’m pretty sure I didn’t cause our snow, but I’m going to keep humming, just in case. Hmmmph. The only snow we got here was the snowflakes I’ve been crocheting hand over fist. Otherwise, we didn’t get so much as a wet raspberry. Of course, the fact that we currently have a humidity of 9% might have something to do with that. Is troubled when it doesn’t rain. And that’s been a bit of a pain. That 9% humidity explains a lot, although it certainly birthed a wonderful limerick. Even though I know on an intellectual level how large our state is, it never fails to amaze me how different conditions can be from place to place at any given time. Oh, yes. And that’s just the plot! — add characters and it’s like trying to ride herd on a houseful of two-year-olds. It’s a major feat to get them to stay out of things and keep them from making a shambles of your plot, never mind get them all to do what you want them to. Thanks for sharing your snow, Linda. I’m glad you got it rather than me, ha! Yours, you realize, melts almost as soon as it falls; ours will pile up into the feet-range, then stick around for half a year! That’s exactly why you would have loved our snow. Around here, it was gone by noon. There were areas of the state when it lasted for a day or two, but still — that hardly qualifies as a snowfall for you. It makes perfect sense to me that you’d have a different attitude toward the stuff. I suspect you feel about snow season dragging on the way we feel about the long, hot summer. I absolutely do! Now, if I could find the perfect place one of these days! Up and out at 4am! But what a treat, and I really like the way the top two photos turned out! It’s a good thing I made myself stay up, or I wouldn’t have seen much of anything. Since it wasn’t cold enough for snow to stick, it was nice to be able to see it falling — but that was over with by 6 a.m. I had no idea what I was doing with the photos, but I was happy enough with them. The shrub in the second falling-snow photo? It’s a crepe myrtle. My sister in Baton Rouge, Louisiana sent pictures of her snowy house and neighborhood saying that it snows there about every 8 years but in the 24 they have been there this is the first time it stuck. The cold has made it to South Florida but it is just pleasantly brisk. I am enjoying the cool air. You know, there’s folklore over here that snow always follows a land-falling hurricane. As I recall, Harvey was down to tropical storm strength before it got to Louisiana, but still — I know people who would draw the connection. It’s great that they had snow that stuck — and nice that you’re getting some pleasant temperatures. None of us needs one of those hard freezes, but a little seasonal weather would be nice! Love the photos and I love your priorities….coffee on, then get dressed. Here in Christchurch we get ever so excited when it snows. Like this snow, it rarely lasts. Coffee first, always. Even Dixie Rose’s brushing has to wait until I have my first cup in hand. She understands, and is patient for a time — but woe unto me if I make a move to the computer before that brushing. She’s been known to carry her brush over to me and drop it at my feet. As I mentioned up above, no matter how much snow falls or how quickly it melts, the beginning fall of flakes always is exciting. I’m hoping for more this year. Ah, Dixie Rose…..how I would love to have my hair brushed by a kind person every morning. But, again, not before coffee. Wishing you more snow! It is uncommon, but that only makes it even more exciting — for everyone. When there’s snow in the forecast, you very rarely hear a grumpy word from anyone. We love it!